Beyonce once again served up style via pictures posted to her instagram page today(July 12th) before she rocked the stage her Barcelona tour stop. 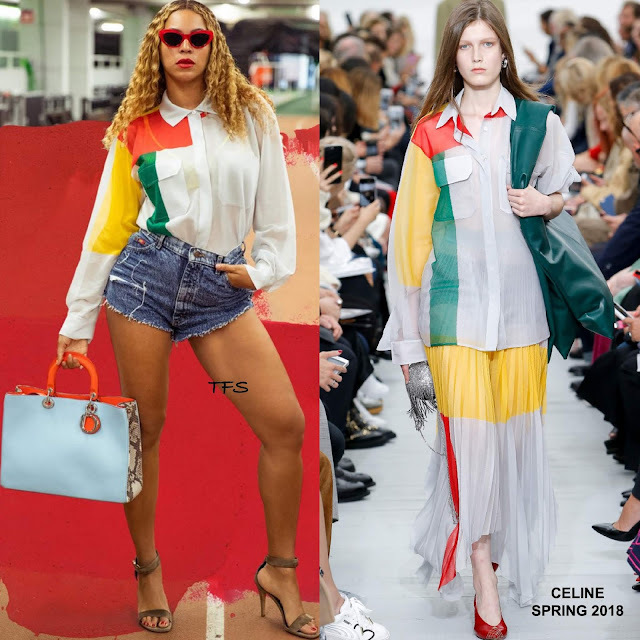 She posed for the gram rocking a CELINE SPRING 2018 see-through color-block long sleeve button down shirt with a yellow lace bra underneath and COAL N TERRY VINTAGE frayed hem denim shorts with a studded bag. Adding to the appeal of her look, she accessorized with red sunglasses, a CHRISTIAN DIOR color-block, snake panel bag and brown suede ankle strap sandals. Center part natural curls and red lips finished up her chic, sultry look. Are you feeling Bey's instagram style?